Whether you're OCD or just really keen on your bookmarks Pins is the app for you. Keep all your bookmarks safely stored, neatly categorized and always at your fingertips. A lifetime of visited web site information in one single app. 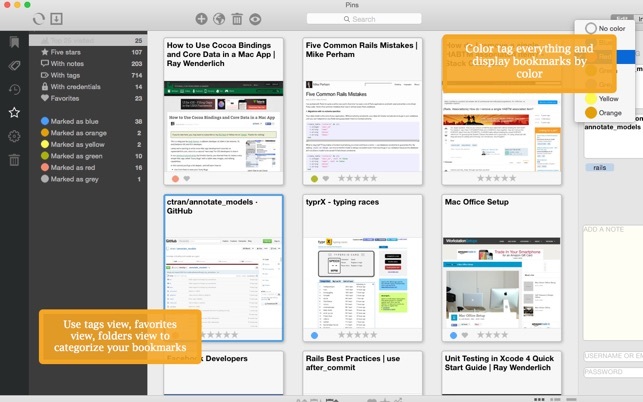 Pins is easy to use but also offers flexibility when working with your bookmarks. You can use tags, folders, color labels, rating and favorite some some of your bookmarks to catalog and easily retrieve what you are looking for. Different views can suit different needs. Are you more of a folder person or more of a tag person? Do you prefer to find the bookmarks you changed or viewed or added lately? Pins offers you many different options to suit your workflow whether you are a professional web developer, a researcher or just keen on keeping the collection of bookmarks you have been working on for years. 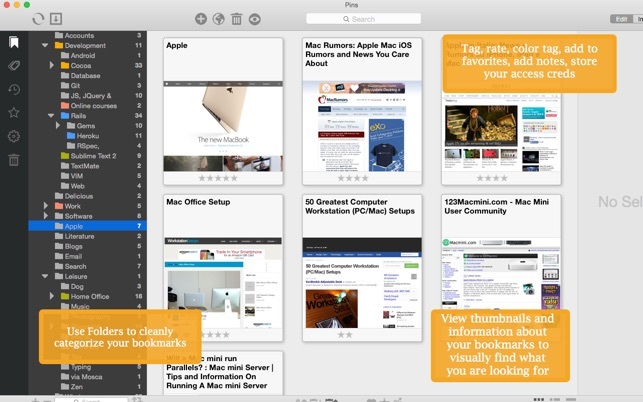 Pins offers you graphical previews to visually browse your favorite sites, live preview, you can add notes to single bookmarks, store your username and password if needed, and more importantly sync this information across different macs. 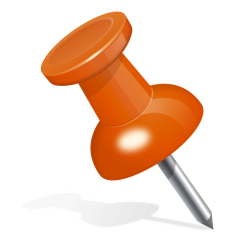 Pins is also a complete Pinboard client and will allow you to use your online bookmarks from within the app and sync back the modifications in real time. You'll also be able to sort bookmarks within your Library or folders by date, title, URL, rating or favorite. Search within the app is extremely powerful and can be fine tuned to search title, URL, notes, folder, tags and so on. You can Import bookmarks from Safari, Chrome, Firefox easily (you'll need to export an html file from these first). Pins comes equipped with powerful browser extensions that will allow you to store bookmarks in Pins without ever leaving your favorite web browser. - Added Save button on Edit screen. Saving is now more explicit and this should be more user friendly and clear. I recently paid for this app and have been in touch with its developer. I reported a problem (editing the description is not saved) and when I tried to follow-up emails sent to the developer’s address and to the support email address during the past week were returned. Since I could not find a phone number, I do not know if he is still in busniess or if he longer provides support… I used the app for a short time. It complements the bookmark provided by Safari (it has basic sorting and find capability, etc.) but it is kind of different than every other bookmark manager that I have used. Yes I've had some email issues and I apologize. Everything is back to normal now. Thanks for your review. So even their own reporting tool for errors doesn’t work. This is very sad, the program appears to have great poential, but if you can’t rely on their backup to backup what you did, what a bad situation. I’d advise people not to buy this application! Hi there. If you drop me a line on my support email I'll be happy to help you out. You can find the support email address on the pinsapp.com website. Buggy, sometimes in obvious ways. This app has a lot of potential but it's buggy. Some bugs are very obvious, bugs you shouldn't make if you have been writing software for a while. For example, if you have one or more bookmarks selected and you switch between tags for some reason it remembers the selection. It's a weird design choice because the articles will be completely different but lets give the developer the benefit of the doubt and let's say that it's intentional. - you click them once, their selection doesn't clear, they stay selected until you click them twice. - you click somewhere else (without holding ⌘) and their selection doesn't clear. It's not a big deal but it took me less than five minutes to notice this bug and to know exactly what's causing it (data out of sync with view). That doesn't give me a lot of confidence in the product.